Home › Register now: Music Ministry Alive! Register now: Music Ministry Alive! To all potential youth and adult applicants: we invite you to visit the site. And remember that the early bird discount deadline to apply is March 15th (FINAL deadline is May 1st). This year's MMA features GIA artists and composers: David Haas (Founder and Director), Lori True, Michael Joncas, Marty Haugen, Tony Alonso, Kate Cuddy, Stephen Petrunak, Bonnie Faber, Lynn Trapp, and Zack Stachowski. Do not delay! Spread the word! Come learn, sing, and celebrate with talented young people from across the country and beyond! Proclaim your love of music, the liturgy, and the awesome presence of God! MMA is held each summer on the beautiful campus of St. Catherine University in St. Paul, Minnesota. It takes place in a daily rhythm of prayer, workshops, and special events where youth participants learn about liturgy, ministry, scripture, and leadership, with many opportunities to sharpen their musical skills. MMA is a wonderful opportunity to grow musically, liturgically, and spiritually and to discover and deepen the leadership potential that God has planted within. The goal of MMA Youth Track is to help each participant grow as an individual so that they can better serve as leaders and ministers in the Church. 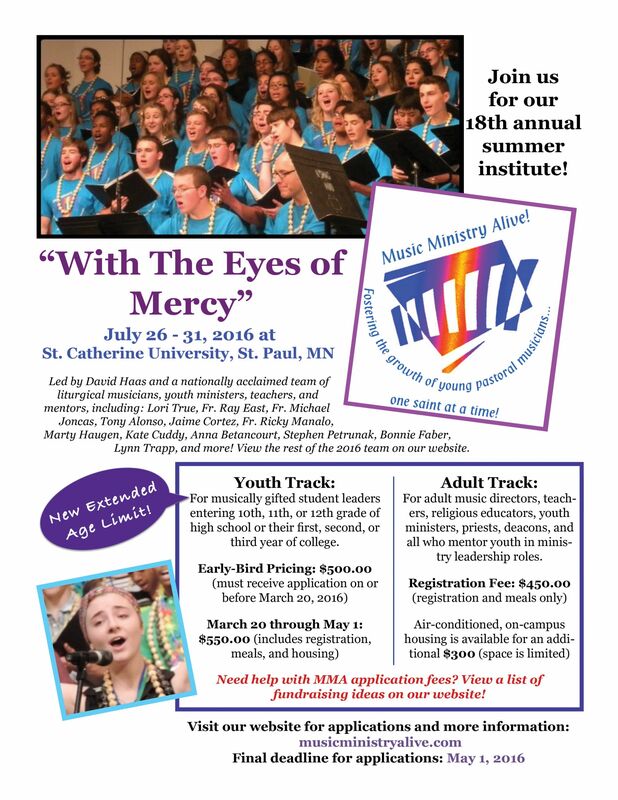 Youth Track is open to any youth who will be entering their 10th, 11th, or 12th grade year in high school or their first, second or third year of college and who is presently involved in or is interested in deepening their call as ministers of music in their parish and school communities. Visit www.musicministryalive.com for more information.